Kickball is a sport that contains elements of baseball, softball and soccer. Kickball rules are designed to offer a flowing, fun game that is played in a safe environment. Competitive kickball rules and regulations are governed by the World Adult Kickball Association (WAKA), which is based in the United States. A kickball field needs four bases in a diamond shape. WAKA kickball rules have bases 20 feet apart, but you can adjust this if you do not have the space. The pitching strip is directly in front of home plate and in line with first and third base. Outer walls should be marked clearly, as a ball kicked over results in a home run. The official ball used in a kickball game is red with a WAKA logo, and it is inflated to 1.5 pounds per square inch. However, a soccer ball or something similar can be used for a fun game with friends. WAKA kickball rules permit a team to field at least eight and no more than 11 players during a kickball game. Basic games of kickball will have varying numbers, so just split your group into two even teams. It is a good idea to have a pitcher and fielders at all the bases. If your group is big, divide into three teams and play winner-stays-on, or have substitute fielders. The pitcher delivers the ball, and must do so with one foot in contact with the pitching rubber. The ball must be rolling or have bounced twice before reaching home plate to be counted as a fair pitch. If the ball passes through the strike zone and the kicker does not make contact, it counts as a strike. A ball that goes wide of the strike zone, is not rolling or did not bounce twice will count as a ball. 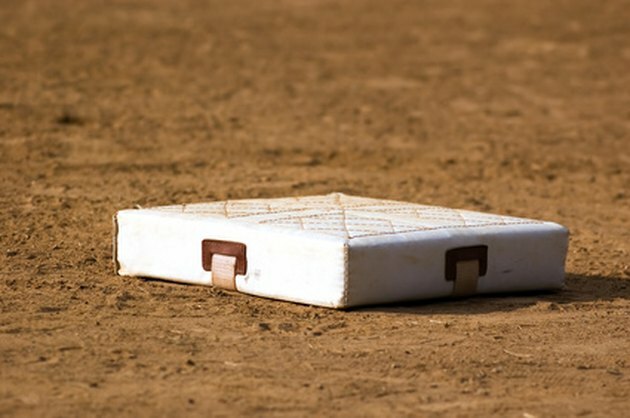 The batter must run to first base after any ball that is kicked. Foul lines extend out from first and third base, and a ball must be inside these lines to be in play (otherwise, it is foul and a strike). If a ball clears the outfield wall for a home run, the kicker and all runners on base run the bases unopposed to home plate. One run is scored every time a runner reaches home. Each team gets three outs per inning. A kicker is out if three strikes are thrown, or if a ball is kicked foul on the third strike. WAKA kickball rules also dictate a kicker is out when the fielding team touches a base with a ball before the kicker arrives, or if he is hit with a thrown ball below the shoulders while running the bases. A kicked ball caught by a fielder before hitting the ground will also result in an out.